Side dish for poultry and pork. This fruity chili jam treats you with sweetness and gently evolving heat. Peel all the fruits and remove any seeds. Clean chilies and remove seeds if you like (I do). Leaving seeds gives you more heat, but different texture for the jam. 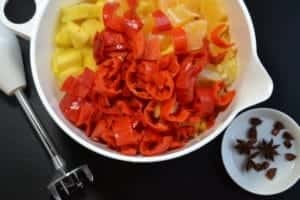 Put fruits, chilies and ginger into a blender and run until smooth. Use a proper blender if you only have one. Mine is handheld model and blending the jam can get a bit messy. Put everything into a 1 gallon (4 litre) pot. Add star anises and a sugar. Boil 15 – 30 minutes in your charcoal grill. Temp around 250°F (120°C). Make sure you work on indirect heating method, charcoals on the other side of the pot or placed evenly around it. Not under it. Sterilize your cans in 300°F (150°C) oven for 30 minutes. Lids should be boiled in hot water. Can the jam while the whole setup is still hot. The hot jam will thicken as it cools and the seal on the jars will dip due to pressure change. This will ensure long validity for your delicacy. Ready made chili jam is valid for few years in sealed jars. When opened, consume within few weeks. 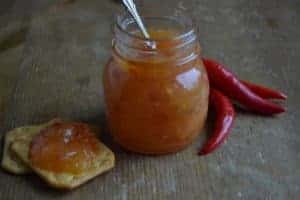 This fruity chili jam is an excellent side dish for white meats. You can also put it on your crackers or just enjoy it as it is.